With the Mountain Collective pass, they cruise the West for skiing, from Banff to Tahoe to the mountains of Utah and Wyoming. Just as the nearly 12-hour drive from Seattle to Lake Louise, Alberta, starts to feel grueling, you hit British Columbia’s Glacier National Park and climb through Rogers Pass in the Selkirk Mountains. My partner, Lauren, and I had hit the road early, watching the sun rise over the Cascades as we traveled north from Seattle on a clear morning last January. More than nine hours, a few Tim Horton’s doughnuts and 500 miles later, we pulled over at the top of Rogers Pass to marvel at the glow of the late afternoon sun on the jagged, snow-striped quartzite peak of Mount Tupper. From there we followed the Trans-Canada Highway east toward Yoho National Park and Alberta’s Banff National Park. We arrived in Lake Louise just as twilight faded — tired, hungry, in need of a drink, but completely awed by the Selkirks and the Canadian Rockies. Our trip was part of an ambitious ski-season plan for a couple of city folks with full-time jobs and a shallow well of disposable income. To our normal slate of local days, we wanted to add visits to Canada’s Sunshine Village, Lake Louise and Revelstoke; California’s Squaw Valley and Alpine Meadows; Utah’s Snowbird; Wyoming’s Jackson Hole, and Idaho’s Sun Valley. We were inspired in our goals by the Mountain Collective Pass (MCP), which guarantees two days of skiing/riding at 14 independent resorts in North America, many of them drive-able from Seattle for those undaunted by the occasional 10-plus-hour day in the car. Pass holders also get 50 percent off additional days at MCP destinations, plus deals at resorts in Australia, New Zealand, France and Japan, and the peace of mind that comes with supporting independent resorts in an era of conglomeration. We’d purchased the passes for $399 in June 2016 because we have family near Sun Valley and frequently ski and ride there. (2017/18 passes, available at mountaincollective.com, are $489 as of this writing; the price increases as the season nears.) The calculus was simple: Sun Valley lift tickets were around $110 at the time. If we used our Sun Valley days and managed a visit to just one other MCP resort, we’d have paid for our passes. Then, at Lauren’s urging, we started to think bigger. We hatched a plan for 15 days at MCP resorts, meaning we would pay just $26 each per day to ski and ride. If we could keep our travel expenses down and mix in stays with friends and family, we’d be on our way to a blissful winter that would otherwise be out of reach. But enough math. Our first stay in Canada was at the Hostelling International-Lake Louise Alpine Centre, an old base camp for mountaineers and skiers where historic photographs lined the walls. 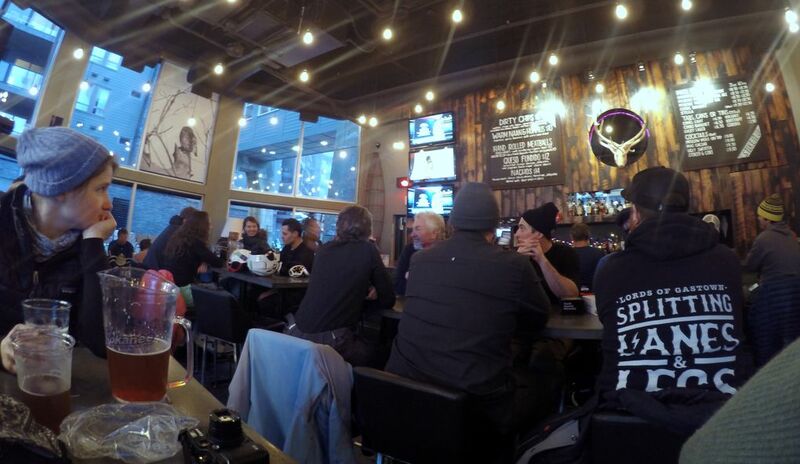 In Canada we stayed in hostels, cooked a majority of our meals and kept our bar tabs low. I was skeptical of the hostel idea. Hostel stays depend too much on how fellow budget travelers (read: young people) behave. We were able to book private rooms, though, so we rolled the dice. 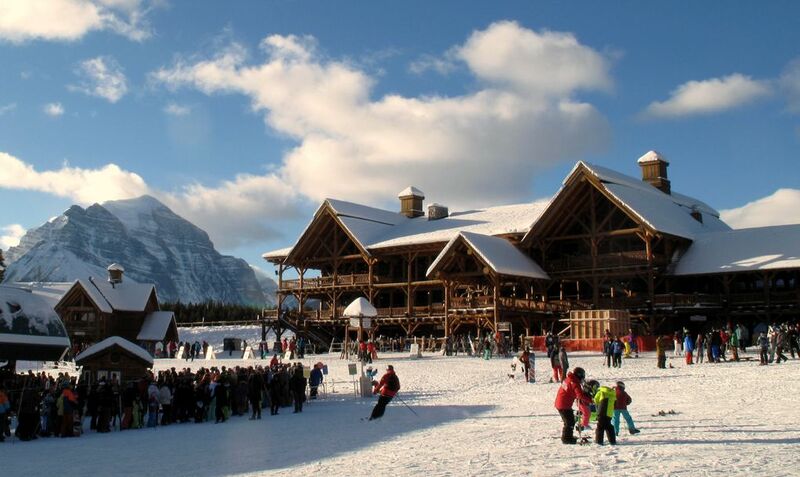 Though aging, Lake Louise Alpine Center was clean and friendly. There was a family with a baby, ski mountaineers prepping for a winter ascent, folks up from Calgary for the weekend, even a couple of retirees. We did our first ski/ride day at Sunshine Village. The sun was out, the snow primarily packed powder, and we got a rare view of “The Canadian Matterhorn,” Mount Assiniboine, which is frequently shrouded in clouds. 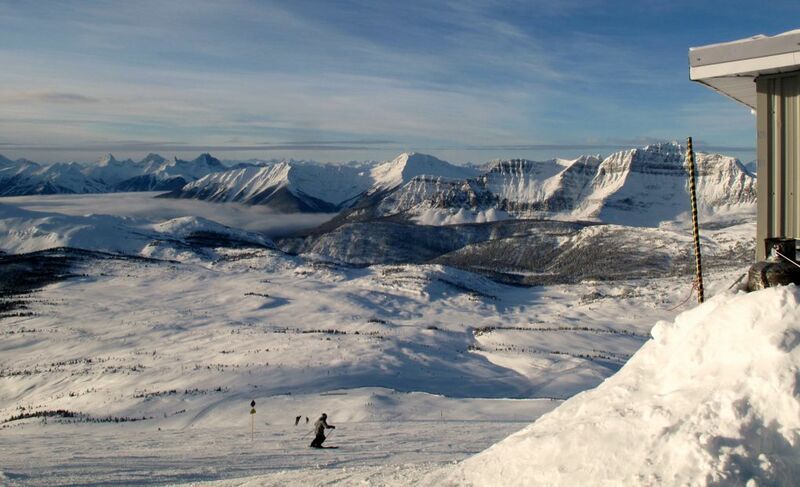 After a quiet night, we enjoyed another sunny-if-cold day at Lake Louise Ski Resort. Snow conditions limited us mostly to groomers, but we found some fun lines in the Powder Bowls and admired the view of Mount Victoria. In Revelstoke we stayed at The Cube. It’s not exactly a hostel, but it’s priced and set up like one. It was delightful: Private rooms with commodes and a crowd whose priority was skiing. Downtown Revelstoke, with a palpable mining, timber and railroad history, was walkable from the hotel, as was the bus to the resort. The Cube also provides guests with passes for the awesome public Aquatic Centre, which has a hot tub, sauna, a couple of pools and a waterslide. We went for a soak/steam all three nights we were there. New snow blessed both of our days at Revelstoke Mountain Resort, or “Revy,” as it’s known colloquially. The 10-year-old resort advertises the most lift-accessed vertical feet in North America. We spent a lot of time exploring glade lines, finding pockets of untracked snow. We pushed 30,000 vertical feet both days. Believe the hype. We vowed we’d return in 2018, then headed back to Seattle via Whistler (which was an MCP affiliate for 2017 but was bought by Vail Resorts earlier in the season). Seattle couple goes ski crazy with multi-resort pass. Tackle these signature runs at 6 Cascade ski hills. What's new at Northwest ski areas. 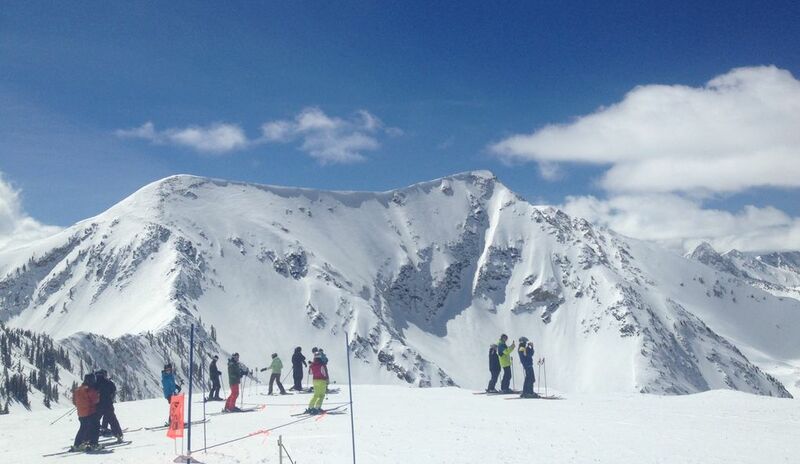 Compare lift prices for region's ski resorts. How to get started in ice climbing. Ski-hut adventure in Oregon's Wallowa Mountains. Our visit to Tahoe’s Squaw Valley and Alpine Meadows in February was a quick-strike mission. We flew to Sacramento on the Thursday before Presidents Day, rented a car and drove to my uncle’s house in Strawberry, about 20 miles southwest of South Lake Tahoe. It had been a brutal winter for local residents — recently retired, my uncle joked that shoveling snow was his full-time job — and more snow was in the forecast. We got up early Friday morning to make the winding 45-mile drive along the lake to Squaw Valley Ski Resort. There’d been eight inches at Squaw overnight and we arrived to light snow and stormy conditions. We were on a sparsely filled first ascent in the High Camp aerial tram, and our reward was several untracked laps before the crowds came and we had to hunt a bit more for untouched lines. We took Saturday off to relax and make dinner for our hosts, before heading to Alpine Meadows on Sunday. More family-oriented and low-key than “Squallywood,” we figured Alpine Meadows would be less crowded on a weekend and it was. It had snowed a foot on Saturday and was in the process of adding another seven inches that day. We made a beeline for Alpine Bowl and a morning of fluffy lines off Ward Peak. By early afternoon the weather conditions deteriorated and we called it good. On our way back south, an avalanche briefly closed Highway 89 near Emerald Bay. It was snowing hard when we left for Sacramento the next morning. Nearly four feet would stack up over the next three days. We should maybe have called in sick. We weren’t expecting new snow for our April trip. Lauren flew out to meet me in Montana, where I’d spent a few days riding in Big Sky with a friend. From there we drove six hours south to Salt Lake City, catching views of the Tetons along the way. Friends hosted us and showed us around Snowbird. It was my first visit, and though we didn’t get any new snow, it was hard to complain about the blazing sun, spring conditions and low-key groomer laps. Soon we were headed back to the Tetons, where we’d booked a couple of nights at The Inn at Jackson Hole, which is cheap, clean and walking distance to the lifts at Jackson Hole Mountain Resort. We happened to catch the second-to-last snowfall of the year, a bit of good karma for our efforts. 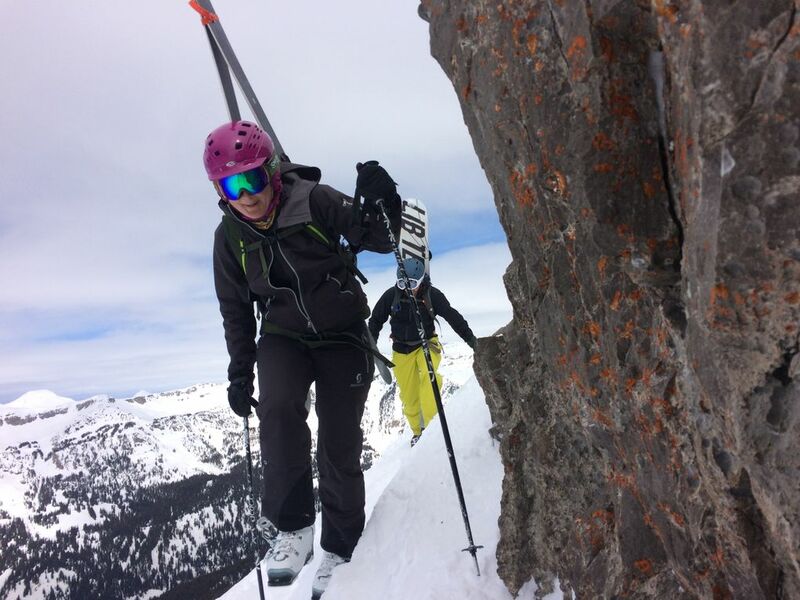 The seven inches weren’t quite enough to completely cover the crust, but we found some deeper spots and I was sufficiently emboldened at the end of the season to ride Corbet’s Couloir for the first time. After a local friend showed us around the famed Jackson backcountry on our second day, I was pretty geeked. Tallboys in the sun on the General Store deck never tasted so good, and I allowed myself to dream about some future descent of Central Couloir. Our last stop was Sun Valley, where we were surprised to find it snowing on the morning of Hawaiian Nationals, a race run by local free-heelers that’s also open to snowboarders. It was a late-season party weekend with some new snow to boot. I hadn’t checked Twitter or read a newspaper in more than a week. All was right with the world, fleeting though the feeling may have been. We’ll be chasing a similar winter this year — we bought our 2017/18 MCPs while we were in Jackson in April. We’d shown ourselves that we don’t need to be millionaires to pursue an epic winter, and judging by the conversations we had with fellow MCP holders at each of our destinations, we were far from alone. For those willing to put some miles on the car and mix in a cheap flight or two, so much is accessible from Seattle. Let’s hope the weather cooperates. 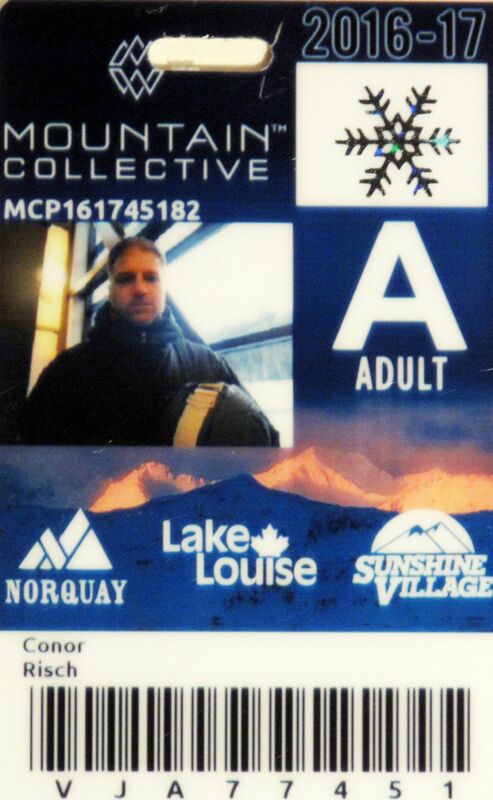 • Mountain Collective pass, featured in this story, covers 14 resorts across the United States and Canada plus ski hills in five other nations, from Australia to France. • Powder Alliance includes 14 ski areas across the West, plus slopes in Japan and Chile. 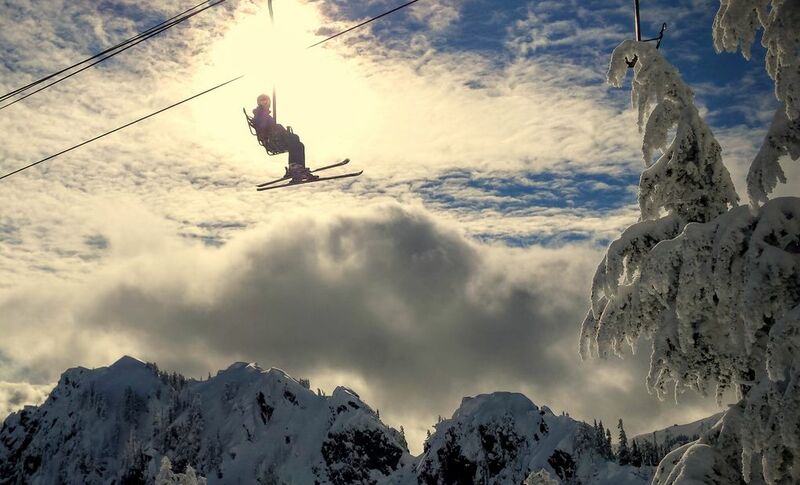 Pacific Northwest resorts include Stevens Pass, Timberline and Schweitzer, plus B.C’s Silver Star. • M.A.X. Pass includes 44 ski areas, including Crystal Mountain, The Summit at Snoqualmie and Mount Bachelor. 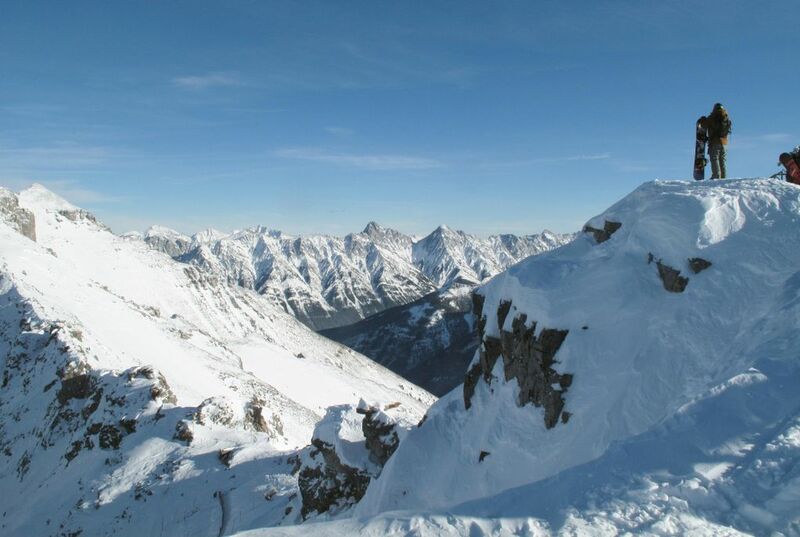 • Epic Pass offers unrestricted access to 15 big North American resorts including Whistler Blackcomb in B.C., Vail in Colorado, Utah’s Park City, plus 30 European resorts spanning the Alps. • Seattle-area homebodies can enjoy three visits each to Crystal Mountain, Stevens Pass and Snoqualmie Pass with the Cascadia Pass. But sorry, the purchase cutoff date for the winter of 2017/18 has passed. Seattle-based Conor Risch is a freelance outdoors writer.